ClubCoins Nødvendigt: 18 Please note that, for now, you cannot download content from our platform directly onto a mobile device (phone, iPod, iPad, tablets...). You need to download your items onto a PC or Mac, and then transfer them onto your device in the normal way. We are working on allowing direct downloads to mobile devices but this is not possible in the current version of the platform. Sorry about the inconvenience! Stanley is elated. His Stop, Drop, and Roll poster won the Fire Safety Month contest.Stanleys prize is a trip to the firehouse! 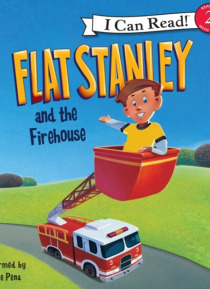 When Chief Abbot invites him to climb onto a real fire truck, Stanley thinks things cant get any better, but the visit takes an even more exciting turn.Beginning readers will love following along with Stanleys exciting rescue mission. Sometimes flatter is better!